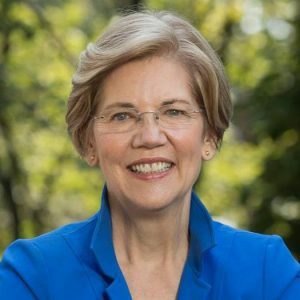 When Elizabeth Warren was elected to the US Senate on November 6, 2012, she became the first female senator from Massachusetts. But her trailblazing didn’t start or end there. Sen. Warren’s very first “first” was at the precocious age of 16, when she became the first person in her family to go to college. She graduated from law school a decade later, having already started to earn a reputation as a dedicated consumer advocate. Her most prominent pre-Senate first was as the inaugural head of the Consumer Financial Protection Bureau, itself the first agency explicitly tasked with guarding Americans from the predatory tendencies of the financial sector. Notably she did not become its first director, blocked by GOP senators who feared the CFPB might actually protect consumers if she led it. During her tenure at the CFPB she continued to teach at Harvard, in 2009 becoming the first professor to win the prestigious Sacks-Freund Teaching Award two times. But Sen. Warren went on to break one of Massachusetts’ hardest glass ceilings. We’re rooting for her and the three other women leading the pack for president to persist in the race to break the hardest glass ceiling of all. Make sure they can get on the debate stage in June—and to the first primaries in 2020. Chip in $20 now to our Get Them on the Stage slate.